Yes! We're getting some wonderful rain finally, so I stopped gardening in the shade house and instead took a walk around the "wood lot" to see if any of the trees we planted are still alive. 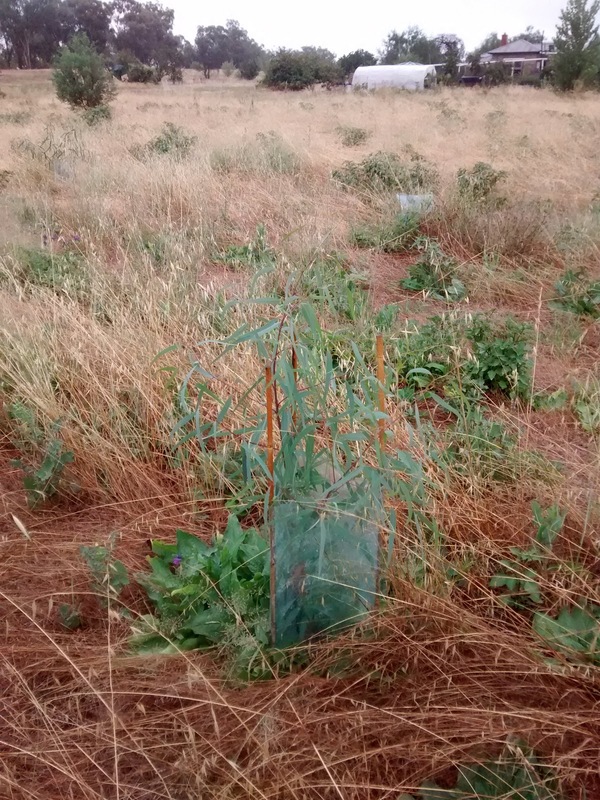 We planted some wattles and yellow box and river red gum trees last winter. Given how dry the winter was, and how harsh the frost was too, I'm really surprised to discover that we've hardly lost any trees at all. Some are even thriving! It's so hard to make them out given the mess the area is in. If I wasn't a complete tree-hugging hippy, I'd say this area was especially weedy and in need of "a few sheep". But just look what "a few sheep" can do! At best, anyone else might say the land on the right is well managed for fire. No weeds, no grass, no snakes. I guess it's "safe"..? Oh, and we don't spray anything or weed around the trees. Sounds like a complete waste of energy, time and money to me! I have a very limited supply of all those things. We used second hand tree guards, and old fencing wire as protection. I did buy the bamboo stakes and the trees (although there are a few home propagated wattles in there too), and I guess I did use a tractor to mow the long stuff down a little before planting. I do love the tractor, but as you can see, it doesn't get much use here. I turned around for this photo of the Murray Pine trees. The young trees take SO long to grow up. The young trees on our side of the fence have been there longer than we have! To make matters worse, they're apparently tasty to sheep, and ripped apart by wallabies and kangaroos on a whim. We've had to cage a few from wildlife on our side of the fence, but they don't stand a chance on the other side. The same amount of wildlife pressure I assume, but on the left in the photo above, far too many sheep. But I love the weeds! Maybe I need a new sign for the front gate.. "Weeds Welcome!" Not that I've got anything against sheep! We'll probably get a few some day. 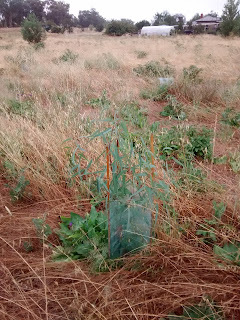 Maybe after a few of the trees have grown up enough to provide some shelter, and after we set up water troughs, and fencing for rotational grazing, etc. There won't be any cute lamb photos for a while yet though. How wonderful to find out your trees are still alive after all that! Great work!